wags83 wrote: Source of the post Went to this tonight. Really fun movie. The rock guy is the greatest character in the Marvel universe. Did you know that Korg was played by the director Taika Waititi? I'm sure I spelled that wrong. I didn't until I read the article that included info about them wanting to bring Korg back in future movies. They also said that the original plan was to only have him in a scene or two, but Chris Hemsworth had so much fun with him and they kept coming up with more jokes for Korg to say that they put him in more of the movie. Yeah, I read that too. Their chemistry was hilarious. I hope they do more Thor movies with Chris Hemsworth and Korg. Be interesting to see where they take it. Korg had such great lines...so silly and dumb that they had us laughing out loud. I liked this movie more than I thought I would! I have a lot of random thoughts I want to say. I'll try to organize them. I loved it. I think I will put it above Guardians 2 and just below Spider-Man. I heard some complaints that people called Ragnarok too silly. I think it got right up to that line, but didn't cross it. I personally thought GotG2 tried fitting more jokes into the movie and not all of those landed. Ragnarok was hilarious, but it could also be serious when it needed to be. There was a good stretch on the trash planet that was joke after joke after joke, but it worked for me because they were in a low stakes situation. I don't remember Banner or Thor being this funny though. I guess it worked so well because it followed the fish out of water theme that Thor 1 did so well. Taika Waititi did a great job with this. I knew he could do comedy well based on What We Do in the Shadows and Hunt for the Wilderpeople (which everyone should watch if you liked this movie), but I was really impressed by his action and artistic scenes. The fight with Hela and the Valkries was beautiful. Korg is now the best character in MCU, right? Everything he said made me laugh and I actually cried I was laughing so hard during the "Miek? He's dead. I stepped on him while on the bridge and I’ve just been carrying him around cause I felt bad." This movie taught me that I have a thing for scary Cate Blanchett. I found her terrifying look to be super secksie. The horns were a little too extreme for me though. Jeff Goldblum in his most Jeff Goldblummy role ever? Dr. Stange is so powerful now! Loki had some great lines too. "I've gotta get off this planet" after seeing the Hulk and "See! That's what it feels like" However, I have some issues with him. I think we have seen the Loki is the bad guy, just kidding - he's good now, double cross! back to being bad, but not bad enough he won't come save you at the last second...only so he can probably be bad one more time and steal the tesseract. It got old for me how much he was flip-flopping. 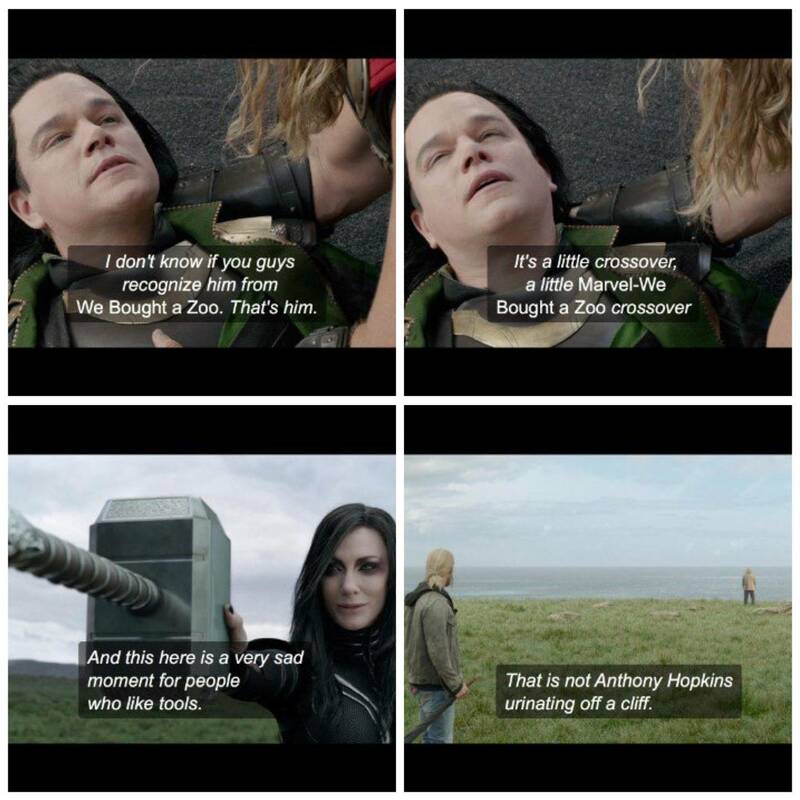 Did he "die" in Thor 2? Did we, as the audience actually think he died or did we see on screen that he tricked Thor? The movie could have played with the time more. Loki said time moves slower on the trash planet and that's why he got there weeks before Thor. I thought this was a clever way for them to take their time on the planet while still having enough time to stop Hela, but they never went that route. I also wanted to hear someone say to Banner that if he was the Hulk for 2 years based on earth time that means he was actually being the Hulk for 130 years (or whatever the crazy number would be). It would also explain how Hulk is capable of talking so well now. Intersteller had a planet with the same gimmick and they used it a lot more for dramatic effect and to move the plot forward. "Loki has tried to kill all of us -- me the most. One time when we were kids he transformed into a snake, and he knows I love snakes. -So I picked up the snake and he changes back and goes 'BLAH! It's me!' And then he stabbed me. We were eight at the time"
-Banner dying on the bridge? He couldn't have survived that fall. Reddit user pointed out another level to the Korg jokes. They meet korg, he says he won't harm you unless you're scissors. End of the movie korg accidentally "kills" Meeks. Meeks weapons were two blades. Rock crushed scissors. Korg also makes a comment about his uprising failing because he didn’t make enough pamphlets. Paper beats rock. The trailer spoiled the reveal of Hulk, but it had to do that because they need Hulk on posters and in promotional material. I think it was great the trailer never showed Thor missing an eye or his new lighting powers. The trailer also did a great job of misdirection. I was fully expecting Hela to wipe out Assguard since the trailer basically showed that. There were actually quite a few scenes in the trailer that were not in the movie. I wish the Loki double knife flip was though, that was a cool bit in the promo material. Tyler wrote: Source of the post I'm bummed I didn't catch the Matt Damon and Sam Neil cameo. Oh nice, I actually said "Is that Matt Damon?" but never bothered to look it up. I didn't notice Sam Neil though. Tyler wrote: Source of the post only so he can probably be bad one more time and steal the tesseract. I'm fully expecting this to be revealed at some point, no way he didn't take it. Tyler wrote: Source of the post Did he "die" in Thor 2? Did we, as the audience actually think he died or did we see on screen that he tricked Thor? He seemed to have died in front of Thor, but at the very end of the movie we see that he has made himself look like Odin and taken over the throne of Asgard. So we already knew he was being a trickster again. Gotcha, now that you say that I do remember the ending of Thor 2. I just knew that the audience never actually thought Loki was dead, but I couldn't remember why I knew that or why Thor thought he was dead. Tyler wrote: Source of the post Gotcha, now that you say that I do remember the ending of Thor 2. I just knew that the audience never actually thought Loki was dead, but I couldn't remember why I knew that or why Thor thought he was dead. End of Thor 2, Loki faked his death to take over as Odin, you see him revealed as Odin in the final shots. Such an amatuer for not remembering. Pretty cool stuff on the rock, paper, scissors. Karl Urban was in the promos as Scourge, literally the whole time. purple_hayes wrote: Source of the post Such an amatuer for not remembering. purple_hayes wrote: Source of the post Karl Urban was in the promos as Scourge, literally the whole time. Sorry for not being perfect like you! I didn't recognize him with the shaved head and muscles. So, are all of Thor's buddies from the other Thor movies dead now? It seemed like Hela killed them very quickly and unceremoniously. wags83 wrote: Source of the post So, are all of Thor's buddies from the other Thor movies dead now? It seemed like Hela killed them very quickly and unceremoniously. Um, the Warriors 3 were all killed. Lady Sif where abouts were never explained, so you don't know if she is alive or dead. But yes, Hela killed off his other buddies. Its okay. You've caught other things that I haven't in other movies. It all evens out in the end. Speaking of killing, this movie had more deaths than any marvel movie before it? The valkrye chick machine gunned a couple dozen alien/human things and they exploded all over. Hela killed hundreds of good guys. One of my favorite jokes in the movie. I agree with your closing thoughts. I would have never thought from the trailers that Thor approved to wipe out Assguard. Saw it last night, it was great. I agree with Tyler that they should have used the passage of time on the trash planet better in the story. Marvel might be getting too silly in some of these movies, but as long as they don't lose the story or my immersion I'm ok with it. bmyoungs wrote: Source of the post I agree with Tyler that they should have used the passage of time on the trash planet better in the story. I need to watch again with commentary. I also heard that his daughter comes in and asks to shut it off and watch Moana instead.